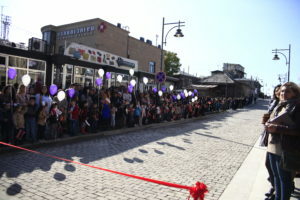 On October 17, 2017 after 6 months of infrastructure works Rustaveli Street was officially presented in its new, renovated look. 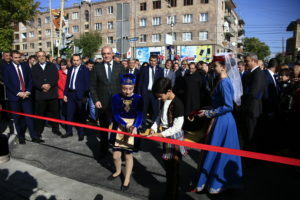 The official event of presenting the completed project was introduced by Kumayri Fund, GPH and the Mayor to the Prime-Minister, other officials and organizations, and of courses the residents of Gyumri. 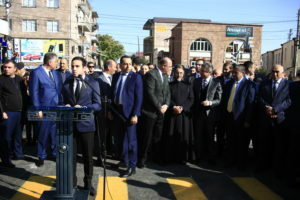 Kumayri Revival Fund, GPH team and the city of Gyumri hosted a 4-hour event which started from short speeches by Gyumri residents who live in Rustaveli neighborhood. People were expressing their gratitude and happiness that their city can finally see brighter days. In his welcome speech the mayor of Gyumri, Mr. Samvel Balasanyan, listed each and every organization, including GPH that played a part in turning an idea to reality. 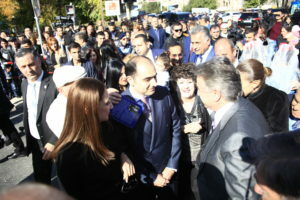 One of the important parts of the day was to show the concepts and endeavors which are planned in Kumayri historic area. GPH presented all the future activities our team envisions for the area based on our recently completed zoning document.